These look delicious! I did have one question-do you have any suggestions for making this vegetarian/ what I could sub for the beef but keep the yummy marinade and other ingredients? Hmm, not really – the beef is a pretty big part of this one! You could try tofu but I have no idea how it would turn out. And probably not the best suited for the slow cooker. Thanks for the comment Joanna! How bout big juicy red or pinto beans? I would try canned jackfruit. I’ve used it as a pulled pork substitute. Same consistency as slow cooked meat. Delicious. Love that idea! I haven’t tried it but I’ve heard great things. I use Seitan strips for my son that doesn’t eat meat. He liked it and asked me to make it again. I’ve been to restaurants that sub jackfruit for meat in vegan dishes. My friend has had it as a pulled pork substitute and says she can’t tell that it’s not meat, becausethe texture is so close. I think you might try that? I have successfully made this recipe with jackfruit a bunch of times, it is great! it really absorbs the marinade and yields a wonderful flavour. also, unlike other meat substitutes it does very well in the crockpot. Glad to hear that, Sophia! Oh – those look amazing! But, it’s killing me because it’s 1 hr to lunchtime – and my lunch looks nowhere as good. I love love love this recipe and I couldn’t give a hoot if it’s not anatomically correct in it’s description. The only description it needs is delicious. thanks Debs! 🙂 appreciate it. 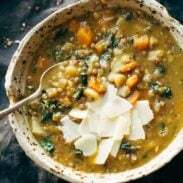 this looks great, and I appreciate you posting this recipe. I’m not sure about the title of this recipe though, there’s a big difference between Korean food (as I am Korean) and food from Bangkok. maybe you’re going for a fusion or something, but this recipe clearly reads like it’s suppose to be Korean (the beef and kimchee). I don’t quite follow where the thai is coming in… maybe I’m being too sensitive as it is your blog… thanks! No LJ, you are not being sensitive. Because as another Korean American myself, this makes me furious. Lindsay, I appreciate your attempt at making Korean inspired food. Sure, you can name the dish whatever you want. However, just remember that we Koreans pride ourselves of our food and its history that comes with it. Our food is something that we, Korean immigrants, hold very dearly to our hearts. It’s more than just food. It’s one of a few ways of remembering home. There’s ZERO connection between Korea and Bangkok in this dish except that it’s your ‘current place of summer in life.’ First, it’s an inaccurate description of the dish since there’s no hint of Thai influence. Stop connecting to completely different cultures, without legitimate reason, just because you feel like it. What you are doing here is mixing up ‘exotic ethnic’ foods (in this specific case it’s just word play) without any understanding of the origin. I mean, does Greek Paris burritos make any sense to you? Can you make a Greek food inspired burritos and throw Paris into it just because you feel like it? Second, you are making profit off of ‘Korean inspired food’ when you don’t even really know what the Korean food is. Your blog is huge and you are making money off of displaying ads and what not. Taking a few well known ingredients (kimchi and bulgogi) of the specific cousin without even taking time to understand what the cousin is, its tradition, and what makes it good or bad is plain insulting. You are making profit with no knowledge of Korean food. You are undermining integrity of Korean cousin and its long history. Please think about impact of your post before you publish it. To you it’s an experiment but to us our food means our home. Experimenting is great and outsider’s view can be taken seriously. However, if you are going to post something publicly, especially when you are making money from it, think twice. You cannot run business without having proper knowledge of your field. Hi Sara, thanks for chiming in. The term “Bangkok Burritos” is one that WSK uses for ALL their fusion-type burritos, whether they hold chicken curry or bulgogi or fried tofu. That’s where that name came from, since it was inspired from one of the burritos at their restaurant. We take all those suggestions seriously, especially when it comes to those regarding cultural sensitivity as it relates to food, which is why I changed the title. Thanks for your input. Perhaps you should just omit the “Bangkok” in the recipe title rather than deflect responsibility as something light-hearted and unintentionally offensive. As another Korean-American, I am offended at your racial insensitivity to this title and at how you downplayed your response when another commented at the two cultures being unrelated. While the recipe looks interesting, your response was unacceptable and insensitive. Please take the “Bangkok” out of this recipe title for the same reason you initially added it on … not because this is summer but because it matters to you that it offends some of the people who make up your audience! Hi KAP, thank you for your input. It does matter to me and I am sorry for brushing it off before. I have adjusted the recipe title – thank you again for the constructive criticism that helps make POY better for everyone. You beat me to it. Thank you for a complete and in-depth explanation of what was making my blood boil. Wow Sara, way to be a triggered special snowflake. May I mirror your ridiculousness and say a Korean with the name Sarah is culturally appropriating a Western name. How insensitive of you and your parents. You mention “profit” over and over. Sounds like a hater to me. Hey Sara- you Koreans pride yourself on your food and your history?? Like what—eating dogs! I agree with this on all terms. Please don’t call this a Bangkok Burrito if it has nothing Thai about it. You are essentially lumping all Asians together and that’s racist and naive. If you actually are open to constructive criticism, please educate yourself about how to be respectful of other cultures. Start with the simplest thing – recognizing that each country has their own culture. I don’t expect you to understand what minorities feel like when they’re all bunched together as if their individual identities didn’t matter, but I hope you can at least try to be respectful of their different cultures. I’d like to agree here. I’m not Korean, and I’m not Thai, but throwing in another Asian city name because it helps with the alliteration seems like a culturally ignorant move. From my perspective, as a non-Asian, if you wanna keep the words “Korean” and “Bangkok” in the title, add something Thai to the dish and chalk it up to uninformed White Girl whimsy. Otherwise, pick one of the other. And for the guy coming in here and calling people snowflakes, go ahead and move halfway around the world, try creating a life for yourself in a racially insensitive country and then have the locals lump your culture in with someone completely unrelated to you. I’d wager, it’d push your buttons too. That’s my $.02. PS. Your Chocolate Chip Cookies are freaking amazing. Thanks! OMG–So shall we start renaming all of our recipes that do not stay true to the original ethnicity of the foods or cooking methods used in that recipe? What about the mashup recipe names of Italian, French, Polish, Spanish, and the rest of the world’s cooking? Please!? Or does this just pertain to the Asian community? As a daughter of first generation Italian immigrants, we did (and still do) experience racially charged attitudes, but we managed to meld our ethnicity with the culture of the U.S. while also maintaining our true cultural heritage and customs. If you desire and demand ethnic purity in all areas of U.S. culture and doctrine, i.e. the melting pot, then perhaps the United States is not where you should be. FYI, the diversity of cultures in the U.S. is one of the aspects of American culture that I love and chastising over something which is so petty in the big scheme of things only gives merit to haters’ arguments, as we can all attest to in today’s climate. And that’s my 2 cents! P.S. Lindsay, I did make this! I toasted tortillas over the gas burner, and all I can say is that there were no leftovers for MY lunch. Maddie- Get a Life and post your own recipes. Be appreciative of her hard work… if you don’t like it, leave. Goodness. I thought this recipe looked fantastic, even if it was a bit insensitive. Post-edit is still a tad offensive, but you can’t win when it comes to fusion. So, kudos for making a delicious looking RECIPE, aside from being culturally insensitive. However, it’s appauling to see how ignorant all these people defending the author are. Racism not only runs deep in your followers, but they’re also ignorant beyond comprehension and are extremely worldly uneducated. They’re the same people who approach all Asians as if we’re all culturally the same. They’re also the ones who raise idiotic children who ask us, “are you Asian or Chinese?” Or, “aren’t you all basically the same?” Hah. Sweet of you to address the constructive criticism, but maybe one day you can redirect your supporters on how to behave like civilized adults living in a very large melting pot of cultures. Since you claim to understand why people are sensitive to their traditions and all. This looks sooo good! I love just about anything I can make in a slow cooker, and my family loves anything in a tortilla (ha!). Thanks for sharing! Same here! 🙂 Thanks Brittany! Would it be possible to make this with a different possibly cheaper cut of beef? These look great! Sure! We just found that the top sirloin was a great cut for texture and flavor. hahaha <3 I love the blurb about nutrition…it means I need to make this now. LOL. Hope you enjoy it, Odessa! This looks incredible! Do you put the meat in the crockpot whole? And do you shred it when it’s done cooking? It’s delicious! Hope you enjoy it, Nicolas! Yowza. Would you judge me if I’m telling you I’m drooling over my keyboard over here. Swoon. You could add some Thai basil to get a little more Bangkok authenticity. Question: do you put the meat into the crockpot whole, or do you slice it up before? Good idea, John! The meat should be sliced thinly before going into the crockpot. Thanks for catching that – we’ve updated the recipe! These look so delicious, who hasn’t wanted to make their Korean food portable? I’m definitely saving this recipe. A good meat substitute is canned Young Green Jackfruit in water, which is available at Asian grocery stores. (For about $1.20 a can here, but also on amazon, just more expensive) It is pretty flavorless on its own, but has a stringy texture that makes it seem very meaty! We smoke it and mix with BBQ sauce for my husband’s vegetarian family members! Made these for dinner tonight and they are DELICIOUS!!! Can’t wait to play around with different add-ins with the leftover meat! Awesome, Jacklyn! Glad you enjoyed it! This was dinner tonight. Wow, wow, wow! Absolutely delicious! We had some locally made kimchi and I made lime rice. Wonderful! Thanks so much for the recipe! These sound so fricken good! Sadly it is several days until payday but I have a pork roast in the freezer, think I could sub the pork for the beef?? Thanks! We haven’t tried it with pork, but I’m sure it would be delicious! Made these last night – awesome! Only thing I did different was use an Asian style red cabbage I had made the night before because I didn’t have kimchi. Loved the Yum Yum sauce.! I had mine bowl style to avoid the gluten – but the rest of family used the shells. We were all happy! I just put meat in the crock pot (I am trying pork since it is what I have). Do you have any suggestions on a substitute for the pear? I seem to have fallen down a rabbit hole with your site! I have been planning my next month’s worth of weekend meals, but have a question for you. 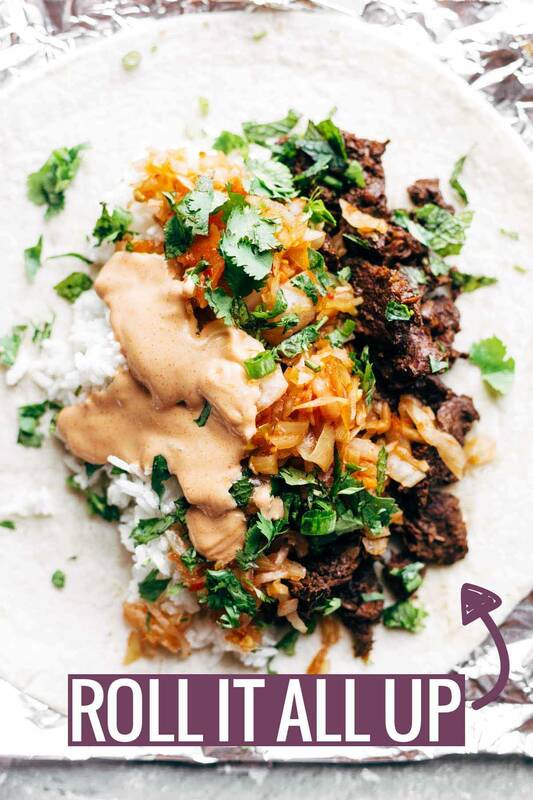 This recipe for Korean BBQ Bangkok Burritos has a similar treatment for the Sirloin as your Korean BBQ Yum Yum Rice Bowls, but the ingredient measures are less for the marinade for the burritos. Is there any reason for this, or are you just looking for a little less intensity for the burrito meat? Thanks for sharing all these delicious ideas! Hi there! I have been doing a food blog for one of my college classes, so i decided that it was about time to take a look at some professional blogs! 🙂 I have to say that your blog looks amazing!! 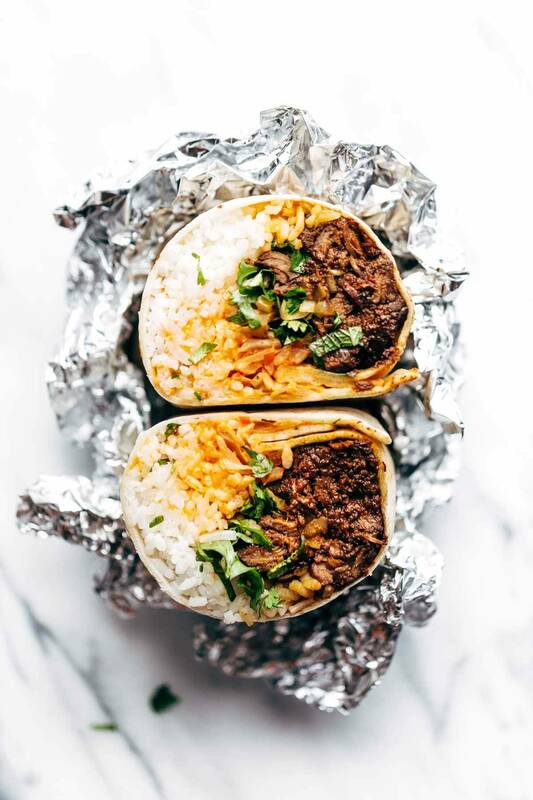 These Korean BBQ Bangkok burritos look to die for and I am definitely going to have to make these for my boyfriend in the near future! Can u read my blog about cravings?